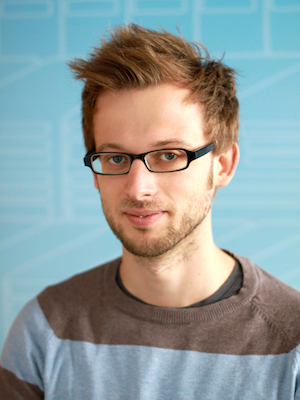 Richard Vogl has a masters degree in computer science with focus on machine learning and is a PhD candidate with Gerhard Widmer at the Institute of Computational Perception at Johannes Kepler University, Linz. He is currently working on the "SmarterJam" project with Peter Knees at the Faculty of Informatics, Institute of Information Systems Engineering at TU Wien, Vienna. His main research interests are deep learning, signal processing, and music information retrieval. Richard Vogl. Deep Learning Methods for Drum Transcription and Drum Pattern Generation. Doctoral Thesis. Richard Vogl, Gerhard Widmer, and Peter Knees. Towards Multi-Instrument Drum Transcription. In Proceedings of the 21st International Conference on Digital Audio Effects (DAFx-18), Aveiro, Portugal, 2018. DAFx 2018 2nd Best Paper Award. Chih-Wei Wu, Christian Dittmar, Carl Southall, Richard Vogl, Gerhard Widmer, Jason Hockman, Meinard Müller, and Alexander Lerch. A Review of Automatic Drum Transcription. In: IEEE Transactions on Audio, Speech and Language Processing, vol. 26 nr. 9, pp. 1457—1483, (2018). Richard Vogl*, Hamid Eghbal-Zadeh*, Gerhard Widmer, Peter Knees. GANs and Poses: An Interactive Generative Music Installation Controlled by Dance Moves. Interactive Machine-Learning for Music @Exhibition at ISMIR, Paris, France, 2018. Hamid Eghbal-Zadeh*, Richard Vogl*, Gerhard Widmer, Peter Knees. A GAN based Drum Pattern Generation UI Prototype. Late Breaking/Demos, 19th International Society for Music Information Retrieval Conference (ISMIR), Paris, France, 2018. Richard Vogl and Peter Knees. MIREX Submission For Drum Transcription 2018. MIREX submission abstracts, 2018. Richard Vogl, Matthias Dorfer, Gerhard Widmer, and Peter Knees. Drum transcription via joint beat and drum modeling using convolutional recurrent neural networks. In Proceedings of the 18th International Society for Music Information Retrieval Conference (ISMIR), Suzhou, China, 2017. Richard Vogl, Matthias Dorfer, Gerhard Widmer, and Peter Knees. MIREX Submission for Drum Transcription 2017. MIREX submission abstracts, 2017. Richard Vogl, Matthias Dorfer, and Peter Knees. Drum Transcription from Polyphonic Music with Recurrent Neural Networks. In Proceedings of the 42nd IEEE International Conference on Acoustics, Speech and Signal Processing (ICASSP), New Orleans, LA, USA, 2017. Richard Vogl, and Peter Knees. An Intelligent Drum Machine for Electronic Dance Music Production and Performance. In Proceedings of The International Conference on New Interfaces for Musical Expression (NIME), Copenhagen, Denmark, 2017. Richard Vogl, Matthias Dorfer, and Peter Knees. Recurrent neural networks for drum transcription In Proceedings of the 17th International Society for Music Information Retrieval Conference (ISMIR), New York, NY, USA, 2016. Richard Vogl, Matthias Leimeister, Cárthach Ó Nuanáin, Sergi Jordà, Michael Hlatky, and Peter Knees. An Intelligent Interface for Drum Pattern Variation and Comparative Evaluation of Algorithms. In Journal of the Audio Engineering Society (JAES), Volume 64 Number 7/8, July/August,2016. Richard Vogl, and Peter Knees. An Intelligent Musical Rhythm Variation Interface. In Demos and Posters Session of the 21st ACM Intelligent User Interfaces Conference (IUI), Sonoma, CA, USA, 2016. Peter Knees, Ángel Faraldo, Perfecto Herrera, Richard Vogl, Sebastian Böck, Florian Hörschläger, Mickael Le Goff. Two Data Sets For Tempo Estimation And Key Detection In Electronic Dance Music Annotated From User Corrections. In Proceedings of the 16th International Society for Music Information Retrieval Conference (ISMIR), Málaga, Spain, 2015. Florian Hörschläger, Richard Vogl, Sebastian Böck, and Peter Knees. Addressing Tempo Estimation Octave Errors in Electronic Music by Incorporating Style Information Extracted from Wikipedia. In Proceedings of the 12th Sound and Music Computing Conference (SMC). Maynooth, Ireland, 2015. Richard Vogl. Drum transcription via joint beat and drum modeling using convolutional recurrent neural networks. At the 21st Vienna Deep Learning Meetup. Vienna, Austria, October 2018. Richard Vogl. From Drum Transcription to Drum Pattern Generation. At the 1st Austrian Music Information Retrieval Workshop (AMIR). Vienna, Austria, June 2018. Best Documentation at the HAMR hackathon 2018 in Paris, for the software hack Neural Bubble Beat, by Florian Henkel, Filip Korzeniowski, Matthias Dorfer, and Richard Vogl. Second best paper award at the 21st International Conference on Digital Audio Effects (DAFx-18), for the paper Towards Multi-Instrument Drum Transcription, by Richard Vogl, Gerhard Widmer, and Peter Knees. Best Gesture and Sound combination at the Waves Vienna Music Hackday 2016, for the hardware hack Metal Stance, by Richard Vogl and Daniel Hütter. Best Bitalino Hack and Best Juce Hack at the Music Hack Day at Sónar 2015 in Barcelona, for the hardware hack JucyPaintAlinoBrick, by Richard Vogl and Peter Knees.